Our family-friendly apartment over two levels is fully equipped for up to six people. The house is optionally a coin-operated washing machine and a dryer. Tumble dryer, ironing board and iron can be found in the apartment. The kitchen is fully equipped with dishwasher, ceramic hob, oven, coffee maker, toaster, microwave, blender and kettle. Cable TV, DVD player and stereo system are once available in the living area. Cot, changing table, stair gate and high chair are included. Behind the house is a children's playground. On each floor is a shower room. All rooms (3 bedrooms, living room, kitchen and bathrooms) have laminate and tiled floors. Child friendly: In the apartment there is a cot, changing table and high chair available. In addition, the sockets are child-resistant and at the top of the stairs is a protective grid. A game box and board games are available. Behind the house is a private playground and a sandpit. On the lower floor there is a bedroom with two single beds. All bedrooms have laminate flooring, enough storage space for things to bring and blackout blinds. All mattresses have schooners. A safe for valuables is available. The living room is spacious and is equipped with a leather couch and two leather armchairs. Flat screen TV with DVD player and stereo are available for free. Board games for adults and also for children are available. A small balcony with seating for two people and cushions are available. There may also be smoked. Quiet zone is the house Strandüne just a few minutes from the center and the beautiful sandy beach Duhner. From here you can plan great trips. Carriage rides, boat trips and bike rides ... Create you want your holiday to suit your. moderne Fewo, ruhige Lage, gute Küchenausstattung, nahe beim Zentrum Duhnen, allerdings hellhörig, es handelt sich um 1/2 Reihenhaus. Gemütliche Ferienwohnung in einem größeren Reihenhauskomplex. Sauber, gemütliche Einrichtung. Alles gut. Kommen gerne in der Vorsaison wieder. Tolle Ferienwohnung mit allem, was man braucht. Sehr schöne Fereinwohnung, topp ausgestattet, sehr sauber. Nur wenige Gehminuten bis zur Ortsmitte und zum Strand. Küche mit allen notwendigen Utensilien. Wohnung 1.Etage und oben unter Dach war in Ordnung.. Dusche unten Seifenhalter nicht vorhanden,aber Schraube war noch drin.Einzelzimmer oben Lattenrost kaputt, im Doppelbettzimmer ging Dachfenster nicht auf.Knarren tut nicht nur die Treppe,sondern auch Gang oben. Wohnzimmer Couch und Sessel sind zu tief (ausgesessen)! !, wir sind 60 bis 68 Jahre alt und hatten es schon schwer daraus aufzustehen. Schade!! Die Seifenschalen in beiden Bäder wurden durch neue ersetzt. Das Lattenrost im kleinen Zimmer wurde ebenfalls erneuert. Die Treppe können wir leider nicht aus tauchen. Das Ledersofa ist eine Geschmackssache und andere Gäste wie auch wir schätzen es sehr. Schade das es Ihnen nicht gefallen hat. 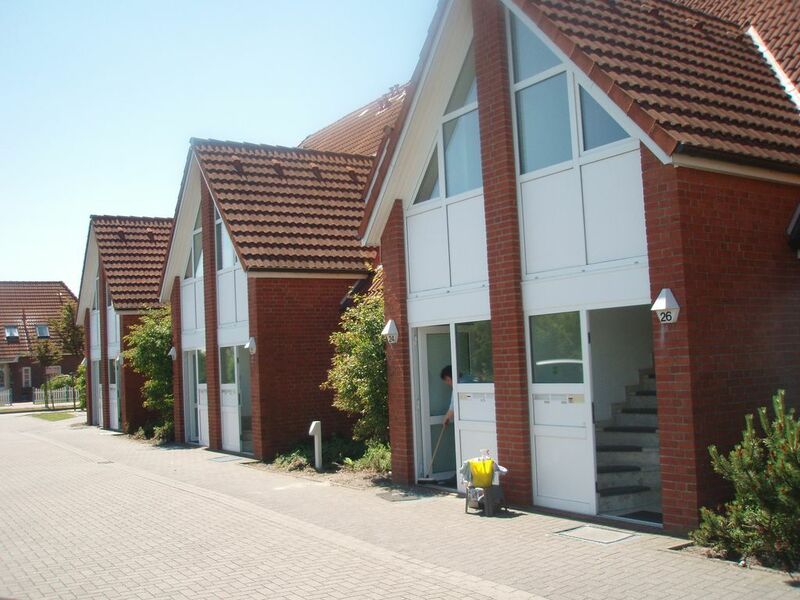 Our apartment is located from the beautiful sandy beach and the Wadden Sea in the peaceful hamlet of Duhnen about 600m. In a few minutes walk from the town center with various shops and restaurants. The seawater surf bath with its beautiful sauna area and the Thalasso center is about 500m away. Cuxhaven town and harbor are easy to reach by bus or by bike along the dike. Boat trips from the port to Helgoland and Neuwerk they can book on site. Watt wagon rides to Neuwerk start from Duhnen daily. Golf: In Oxstedt is an 18 hole golf course High Klint. Preise gelten für 2 Personen pro Nacht, jede weitere Person wird mit 10 € berechnet. 55 Euro Reinigungsgebühren werden bei der ersten Nacht abgerechnet. Die Kurtaxe der Stadt Cuxhaven beträgt 2,80€ pro Nacht, Kinder bis 16 Jahre sind frei. Die Kurtaxe ist bei Anreise an den Vermieter zu zahlen, Sie erhalten dann auch Ihre Kurkarten. Ab März 2018 erhebt die Stadt Cuxhaven zusätzlich eine Bettensteuer von 2,75 % auf den Übernachtungspreis. Wäschepacket ist zu buchbar für 15 € pro Person.